Need inflight catering in Chicago? Debbi has used her passion for the culinary arts to fuel her career in the food industry that has spanned 31 plus years. 13 years ago, she entered the in-flight catering niche, and has been leading our Chicago team ever since. Over this time, Debbi has built a team of seasoned professionals to provide beautiful food and outstanding customer service to our clients flying out of Chicago. She has many long-standing clients who enjoy the extra touch of detail she and her team have been known for. 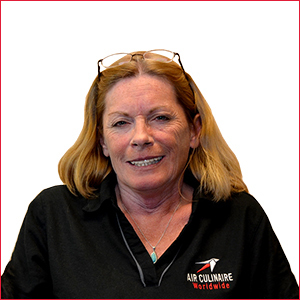 Debbi and the Chicago inflight catering team look forward to serving you.